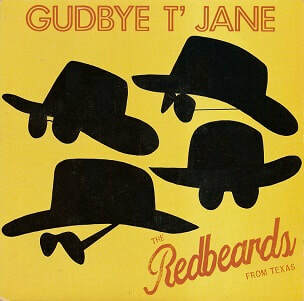 Gudbuy T'Jane is the second single from the British rock band The Red Beards from Texas, released by Receiver Records in November 1986. A cover of the Slade's 1972 hit, it was written by Noddy Holder and Jim Lea, with the Red Beards from Texas' version produced by Lea. The song would be included on the band's 1987 album Havin' a Ball. The Red Beards from Texas formed in the 1980s as a local outfit from Birmingham who were heavily influenced by ZZ Top. By 1986, the band had gained something of a reputation for their concerts and through Dave Hill's acquaintance of the bassist Bud Weisman (Craig Fenney), both Jim Lea and his brother Frank became involved. It was Frank who suggested to Jim that he should produce the band. In 1984, Noddy Holder had joined the band onstage at the Wolverhampton Civic Hall and December 1985 saw Lea join them on stage to play guitar during their show at JB's Dudley. Following the gig, Lea told the Slade International Fan Club: "They mimic ZZ Top, but they're a brilliant band with it and have a great sense of humour." The band's debut single, a cover of the Beatles' "I Saw Her Standing There", was released in May 1986 and had been produced by Lea. It failed to chart, although it did gain radio airplay. Inspired by the near success of the single, Lea returned to the studio with the band to record a follow-up single. Lea suggested the band cover Slade's "Gudbuy T'Jane", which the band agreed to do. It was recorded at Roundhouse Recording Studios during September 1986. In a 1986 Slade fan club interview, Lea said: "We did "I Saw Her Standing There", though totally re-arranged, earlier this year, which made a dent, so I am here now doing the follow up single "Gudbuy T'Jane". The Beards didn't want to do it at first, though after a few days in the studio with it, they loved it." "Gudbuy T'Jane" was released in November 1986, but also failed to chart. "Gudbuy T'Jane" was released on 7" vinyl by Receiver Records in the UK only. It was distributed by Pinnacle Records. The B-side, "Drinkin' on a Saturday Night", was an original track written by the band members Morton Pinkley (Ian Allen) and Wild Hoss Maverick III (David Keates). In 1987, "Gudbuy T'Jane" would on the band's only album Havin' a Ball, however the B-side remained exclusive to the single. "Drinkin' on a Saturday Night"
Dave Gardland - engineer on "Drinkin' on a Saturday Night"